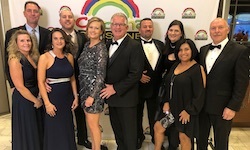 Little Mountain, SC (January 28, 2019) - On Saturday, Pleasurecraft Engine Group sponsored the 25th Annual Wishing Well Gala by Carolina Sunshine For Children. Since 1983, Carolina Sunshine has granted over 1000 wishes for children with uncertain futures. When a wish is granted, the entire family gets to participate, and all expenses are paid. The Annual Wishing Well Gala helps fundraise to give these children their ultimate wish. This is the fifth year that Pleasurecraft has sponsored the gala. Five employees had the pleasure of attending the dinner. Each year, it is an opportunity for Pleasurecraft employees to have fun and grow as a team.